This article is about NASA-awarded Distinguished Service Medal. For other U.S. versions, see Distinguished Service Medal (disambiguation). 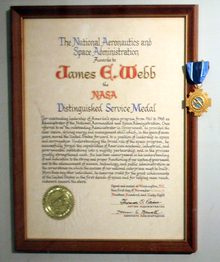 The NASA Distinguished Service Medal is the highest award which may be bestowed by the National Aeronautics and Space Administration of the United States. The medal may be presented to any member of the federal government, including both military astronauts and civilian employees. "distinguished service, ability, or courage, [that] has...made a contribution representing substantial progress to aeronautical or space exploration in the interests of the United States"
The NASA Distinguished Service Medal is awarded to those who display distinguished service, ability, or courage, and have personally made a contribution representing substantial progress to the NASA mission. The contribution must be so extraordinary that other forms of recognition would be inadequate. Typical presentations of the NASA Distinguished Service Medal included awards to senior NASA administrators, mission control leaders, and astronauts who have completed several successful space flights. Due to the prestige of the award, the decoration is authorized for wear on active uniforms of the United States military. Another such authorized decoration is the NASA Space Flight Medal. Upon the recommendation of NASA, the president may award an even higher honor to astronauts, the Congressional Space Medal of Honor. The medal was original awarded by the National Advisory Committee for Aeronautics and was inherited by NASA. The first NASA version (type I), featuring the NASA seal, was issued from 1959 until 1964, when it was replaced by the current type II medal (shown). Robert O. Aller received DSM on November 26 1984. Signed in WDC by James Beggs. ^ Morris, John S. (1961) "President Will Give Medal to Astronaut", The New York Times, May 7, 1961. ^ "President Kennedy Awards the NASA Distinguished Service Medal to Major Gordon Cooper, 21 May 1963". ^ "Astronaut Bio: Robert L. Crippen (07\2001)". ^ "Astronaut Bio: Franklin Story Musgrave (M.D.)". ^ "Chief Of Staff Courtney Stadd Announces Plans To Leave Agency". NASA Newsroom. May 27, 2003. Retrieved 2 January 2017. ^ "Astronaut Bio: William McCool 5/04". ^ "NASA Marshall Space Flight Center Honors Employees at Annual Awards Ceremony". ^ "Christopher Scolese Receives the NASA Distinguished Service Medal (200908120001HQ)". ^ "NASA Agency Honor Awards 2010" (PDF). NASA. ^ "Distinguished Service Medal" (PDF). Archived from the original (PDF) on 2015-02-03. ^ a b "NASA Awards" (PDF). Spaceport News. 7 September 2012. Retrieved 7 September 2012. ^ "Distinguished Public Service Medal Honorees". 7 September 2012. Retrieved 23 February 2018.